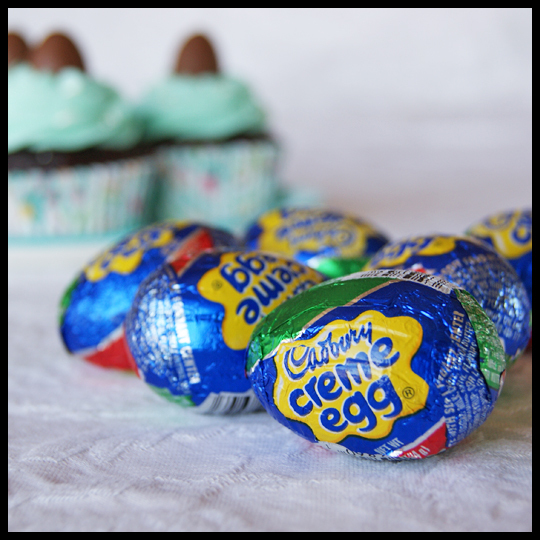 I don’t think I need to explain the awesomeness of Cadbury Creme Eggs, right? There’s something about them that causes excitement for their return every spring. 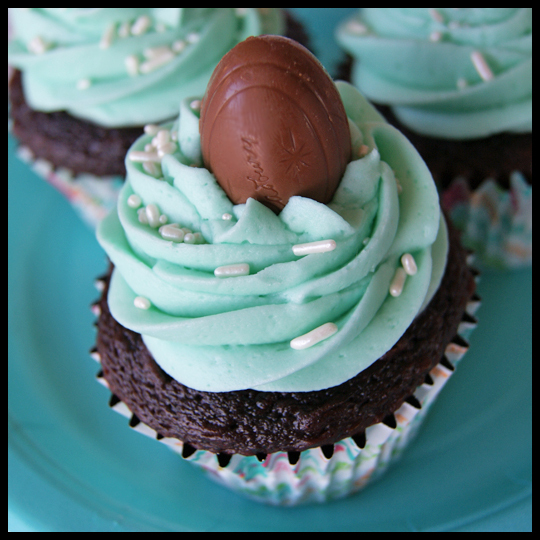 So it seems only natural for the cupcake-lover in us to desire a merge between these wonderful morsels and cupcakes. 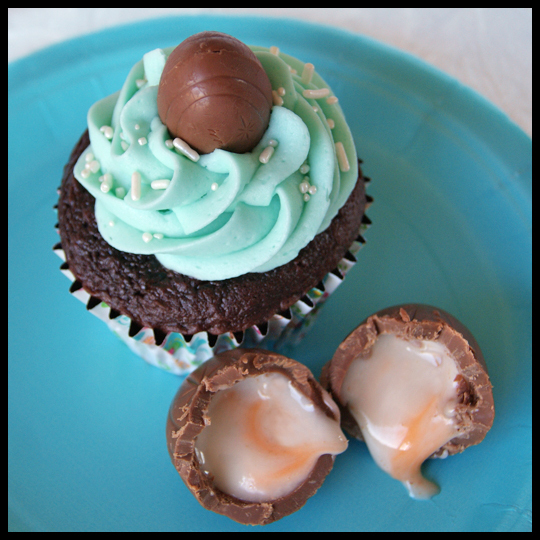 Because of this desire, there are A LOT of Cadbury Creme Egg cupcake recipes on the internet, but when I saw one from Pizzazzerie (one of my favorite blogs) it really stood out to me. I shared it with Guest Crusader Jen because teal is her favorite color and she loves Cadbury Creme Eggs more than anyone I know. She was visiting me the following weekend and quickly requested that we make them while she was here. So we did! After looking at Pizzazzerie’s recipe, Jen and I decided to make a few modifications. While I would have loved follow the chocolate cake (from scratch) recipe, we decided to use a boxed mix, adding in a pack of pudding for extra moisture. It turns out that this was a really smart choice because I managed to forget the eggs in our batter! Thirty seconds after placing the cupcakes in the oven, we had to pull them out, fish out the chocolates, dump the batter back into the bowl, just to mix in eggs and start all over again. Can you imagine how much I would have messed up a scratch recipe? It was not my night to bake! 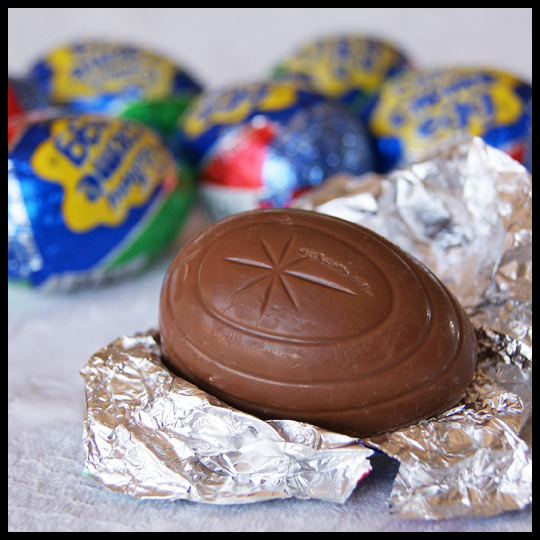 Another small change we made was using mini Cadbury Creme Eggs instead of the full-size ones. The full-size chocolate eggs would have been better in the end, but it would definitely be more costly. The mini eggs sunk to the bottom and melted more than it seems the full-size do. One tip a friend gave me is to freeze the candy first and then it doesn’t melt as much during the baking process. I did make my own frosting, using Pizzazzerie’s recipe. Instead of almond extract I substituted pure orange extract, since Jen isn’t keen on almond flavor. I like almond, so I’m sure that would be an amazing complement to the Cadbury Creme Eggs, however the orange gave the frosting a hint of citrus flavor that went perfectly with the chocolate. I’ve only ever used fresh oranges for flavor, so I was concerned about overpowering the cupcake with citrus. For that reason, I only used 1/2 a tablespoon of extract. In the end, Pizzazzerie’s recipe yielded the perfect consistency for piping frosting (and also had a great flavor before adding the extract). It will now be my go-to buttercream recipe. 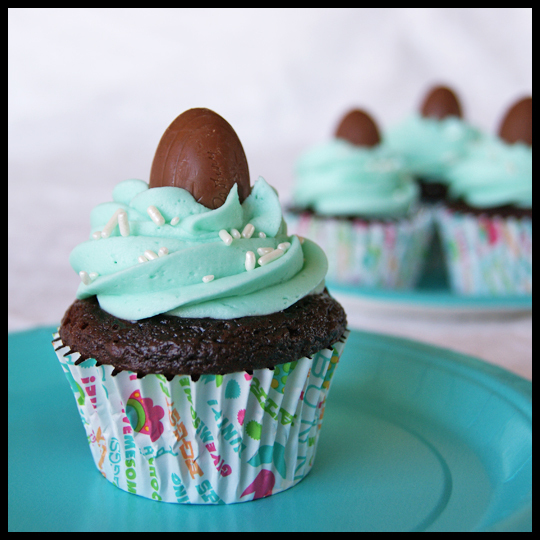 We hope you are able to indulge in some fun cupcakes this weekend. Have a Happy Easter!